Mist periodically gently flowed across the springs. The bight sun shining through left a warm feeling of pastels. This time patience paid off as I waited for the mist to clear then re-enter. 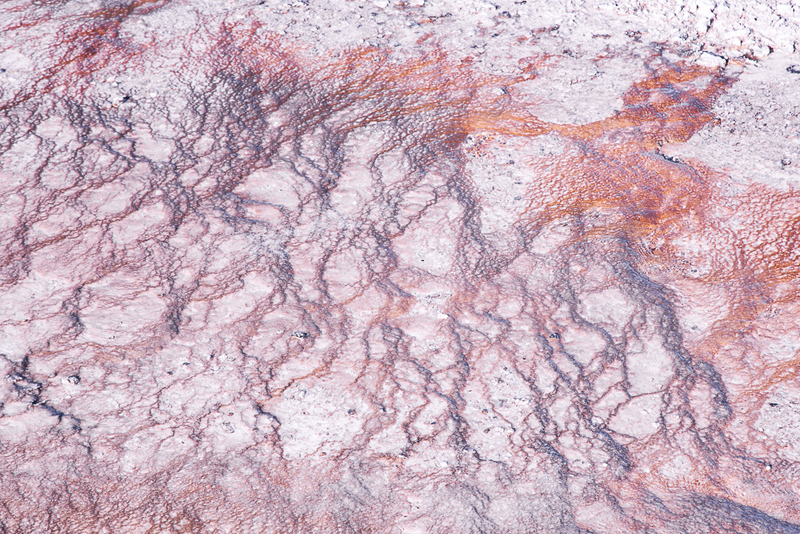 This entry was posted in Abstracts, Geology, The Intimate Landscape and tagged Abstract, geology, Grand Prismatic Spring, pastels, Wyoming, Yellowstone Park on July 5, 2017 by kgrafphoto. Slow flowing water from the springs also left small rivulets. These colorful ones were a sharp contrast to the grey mineral flats in my prior post. This entry was posted in Abstracts, Details, Geology, The Intimate Landscape and tagged geology, Grand Prismatic Spring, Wyoming, Yellowstone Park on July 3, 2017 by kgrafphoto. 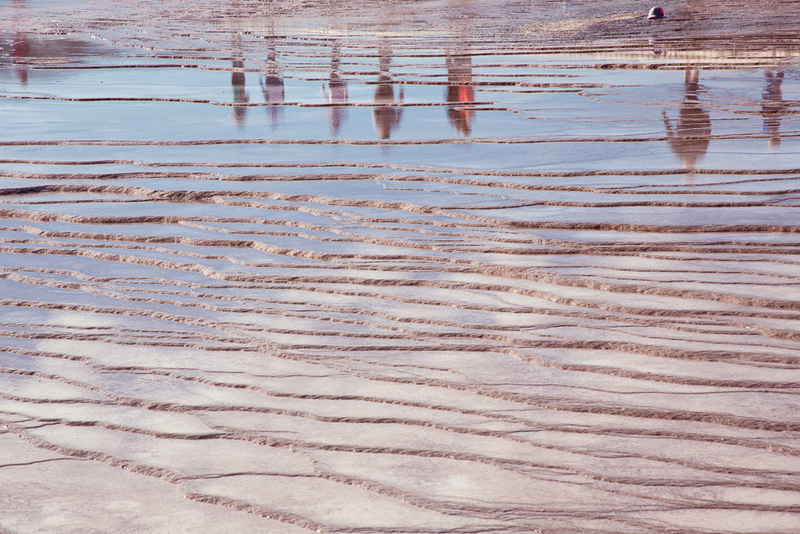 As the hot mineral water flows out of the spring, it creates a series of mineral flats. This perspective was a flat grey. I decided to convert it to black and white, add contrast, and apply a slight gradient across the image.. 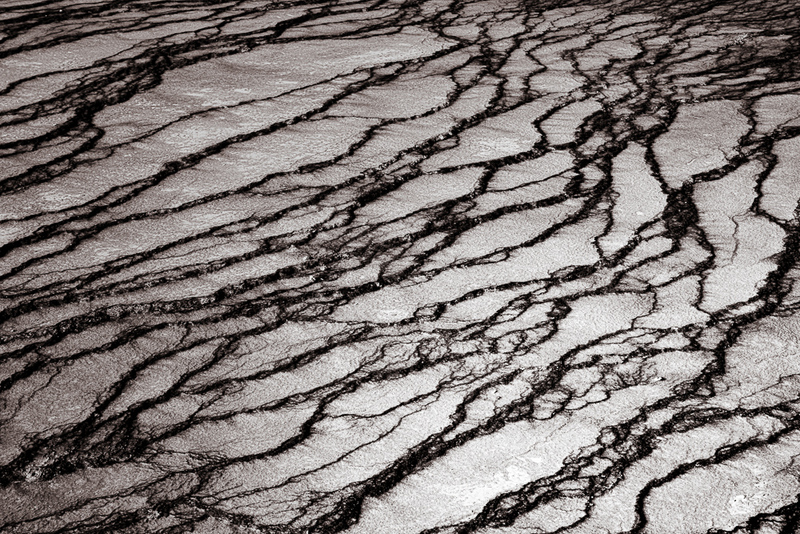 This entry was posted in B&W Photography, Geology, The Intimate Landscape and tagged Abstract, geology, Grand Prismatic Spring, lines, Wyoming, Yellowstone Park on July 2, 2017 by kgrafphoto. A boardwalk runs along the edge of the spring. The reflection of people walking along the walk caught my eye when the mist periodically lifted. I did not have the foresight to be patient and take an image with a light mist to create the mystic feeling I felt. Lesson learned; Be ready to capture a “feeling” and not just a “picture”. 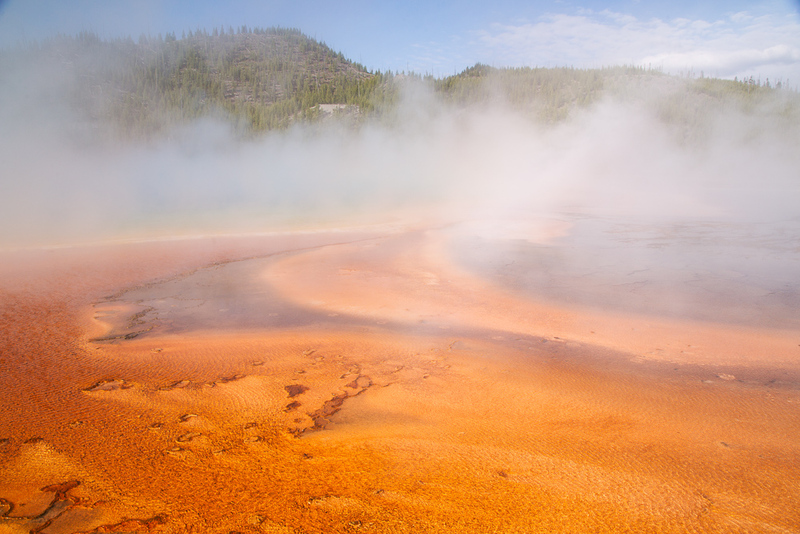 This entry was posted in Geology, The Intimate Landscape and tagged geology, Grand Prismatic Spring, Wyoming, Yellowstone Park on July 1, 2017 by kgrafphoto. 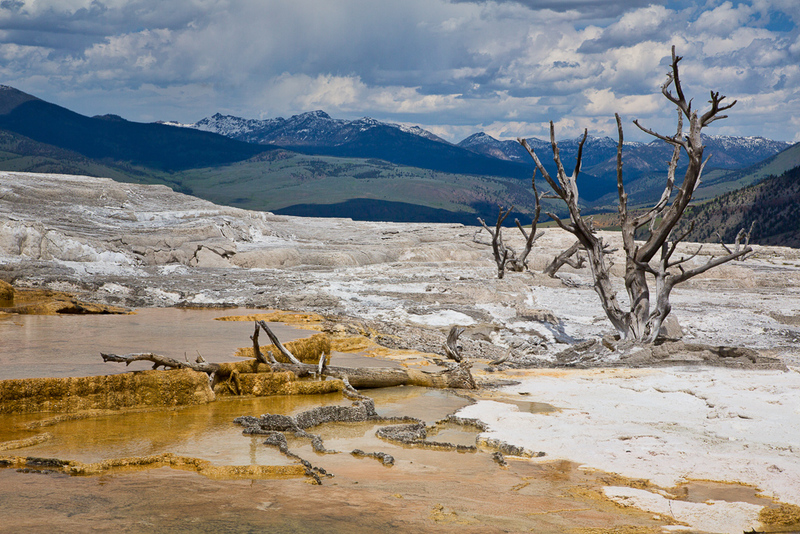 The Grand Prismatic Spring in Yellowstone National Park is the largest hot spring in the United States and the third largest in the world. The immensity of the spring is very difficult to capture from the ground level. I had my 24-105mm lens and only could capture a portion of the spring. I could not change to my 14mm wide angle because of the extreme harsh mist generated by the hot spring. On my next visit I will make two trips to photograph from the ground level. The first will be with my wide aperture lens to try to capture as much of the overall grandness of the spring. The second will be with my mid-range zoom to capture the details. To get a full photo of the spring, one needs to hike up the trail on the hill above the spring. The trail is currently (June 2017) in construction and not accessible.. I found the details of the water and mud beds below fascinating. Lines, colors, and reflections intrigued me. I will display images of some of those images in future posts. 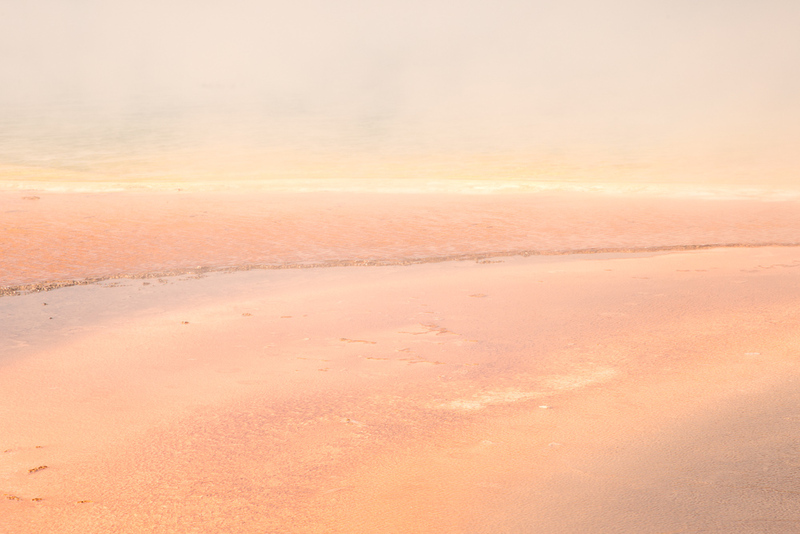 This entry was posted in Geology, The Grand Landscape and tagged geology, Grand Prismatic Spring, mist, Yellowstone Park on June 30, 2017 by kgrafphoto. This image was taken from the bottom of Frenchman’s Spring Coulee near where it enters the Columbia River. Sentinel Gap was cut across the Saddle Mountains by the Columbia River and the Ice Age Floods. 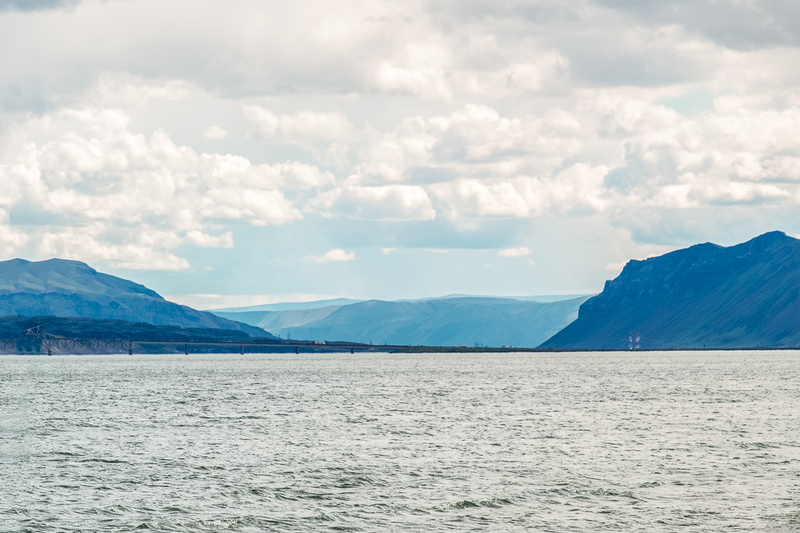 During the floods, the Columbia River was at a level near the top of the eastern slope of the Gap. On the north side of the Gap, the Vantage Bridge and Wanapum Dam are faintly visible. Through the Gap, Umatilla and Rattlesnake Ridges are visible. And of course, the clouds make the image. This entry was posted in Geology, The Grand Landscape and tagged Columbia River, Eastern Washington, geology, Rattlesnake Mountain, Sentinel Gap, Umatilla Ridge on April 19, 2017 by kgrafphoto. 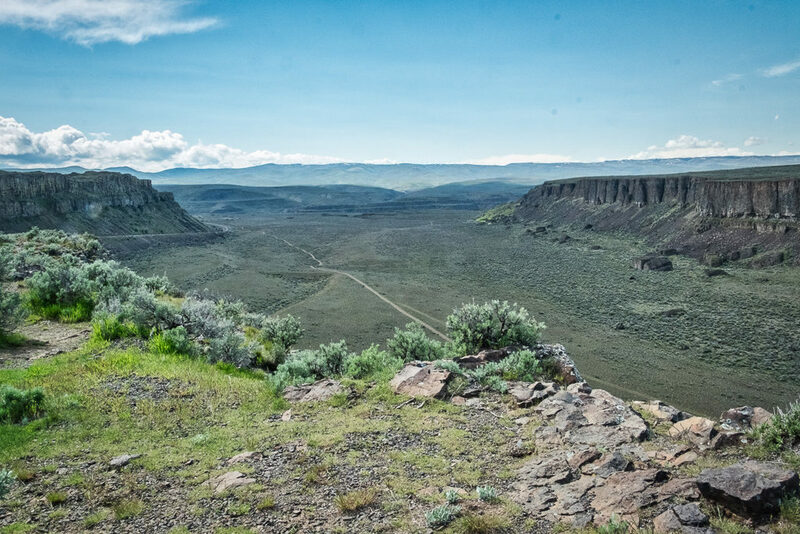 This image is taken from the top of the Frenchman’s Spring Coulee looking down toward the Columbia River. The mountains in the far background are the Cascade foothills. 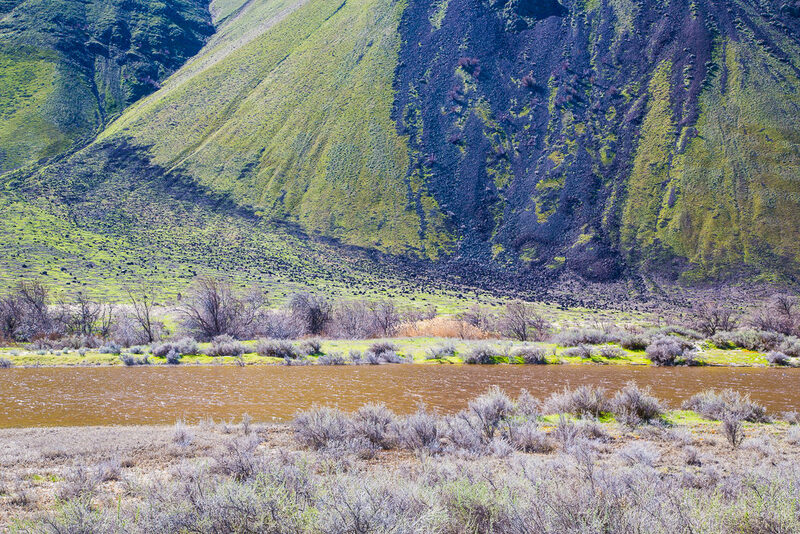 This coulee was created during the Ice Age Missoula Floods. It is the farthest south water path from the Quincy Basin to the Columbia River. The flood waters in the Quincy Basin were split by the Frenchman hills, just south of this coulee. The water flowed east into the Drumheller Channels toward Othello and west into the Columbia River via several coulees including Frenchman Springs. The wind was howling, so I did not feel like getting too close to the edge. I bet this will make a good sunset or sunrise photo. I will be back. This entry was posted in Geology, The Grand Landscape and tagged coulee, Eastern Washington, Frenchman's Spring Coulee, geology, Quincy Basin on April 18, 2017 by kgrafphoto. This entry was posted in Geology, Panography, The Grand Landscape and tagged Drumheller Channels, geology, Othello, Spring on April 15, 2017 by kgrafphoto. This image was taken from Lower Crab Creek Road. It is a small section of the Corfu Landslide. Lower Crab creek is in the foreground. This part of the landslide was probably post Missoula Floods. It looked like the rocks at the base were not eroded, hence it probably occurred following the last floods. The land slide extends upward to the Saddle Mountains crest. A couple of weeks prior to taking this image, I was at the crest of the Mountain looking down. Refer to my post of 27 March. This entry was posted in Geology, The Grand Landscape and tagged Corfu Landslide, Crab Creek, Eastern Washington, geology, Othello, Saddle Mountain on April 12, 2017 by kgrafphoto.